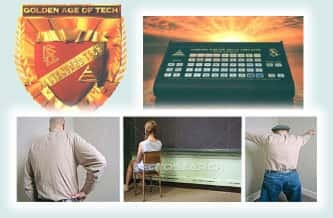 The following is a brief chronology of the out-tech David Miscavige, Chairman of the Board (COB) of the Religious Technology Center, has injected into the training line-up since his rise to power in the early 1980s. 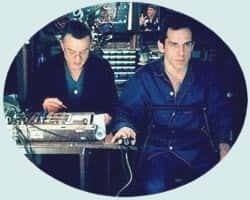 At the Mission Holder's Conference in San Francisco, COB and his new Management team declare approximately 85% (28 out of 33) of the U.S. Mission Holders as suppressive. "Strong ethics actions by org E/Os and MAAs against missions and mission holders is forbidden. …Missions are essentially PR activities. When you use ethics, you mix practices. There is already a protective mechanism in missions. 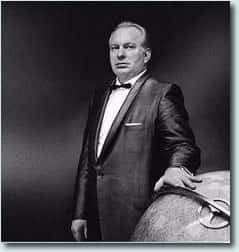 If they hold to Dianetics and Scientology and stay true to source, they prosper. When they don't, they go broke as their PR value loses its reality factor. …It is not our policy to harshly handle missions. “Now any time you find thirty people on staff being removed because they were suppressive, you know they had the wrong Why, because the percentages are wrong. It's just as mathematical as that. Before this conference, missions were a major feeder line to orgs for the processing and training of their public. 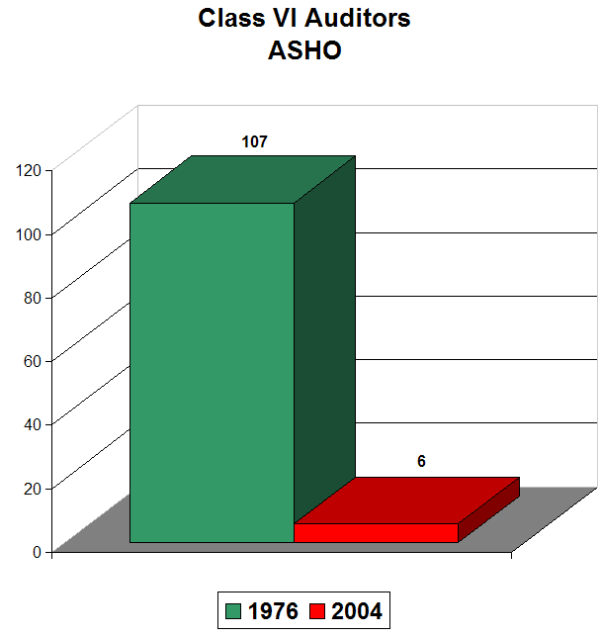 ASHO, for example, used to publish a list of their top 10 FSM groups for the year. Of these 10, an average of 3-4 were missions, out-producing their org counterparts. Immediately following the conference, this statistic dropped dramatically, and has continued to drop ever since. Currently, the number of students sent by missions to orgs for higher training is a fraction of what it had been. COB next takes on field auditors. Utilizing his newly-formed I-HELP, the field is scrutinized like never before. Field auditors are ordered to send all their pc folders into the org for inspection. They are also ordered to video. In some instances, their homes and auditing rooms are inspected and photographs taken and sent uplines. As heads on a pike, several field auditors and C/Ses are declared, and others ordered to Comm Ev. In light of these and other attacks, field stats plummet. 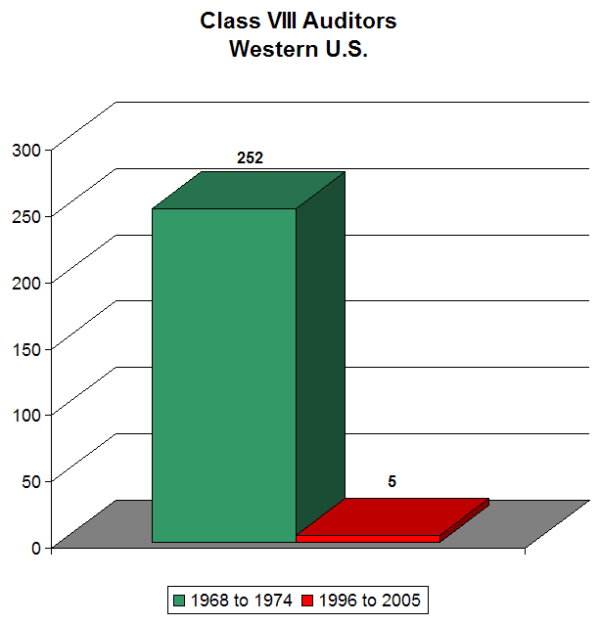 Within 6 months, over 70% of active field auditors in L.A., Clearwater, and elsewhere stop auditing. Many were Class VIIIs. A militant org attitude to keep the field straight is silly. 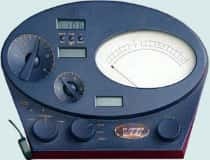 Aside from the loss of these field auditors — many of whom were frequently on training lines themselves — the heavy ethics levied against them acted as a strong deterrent to numerous Scientologists who had once wanted to become auditors but were now afraid of being hit. 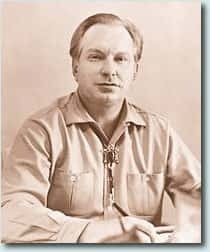 "Auditors have since the first session of Scientology been the only individuals on this planet, in this universe capable of freeing man. …An auditor is to be respected. “It is my opinion and knowledge that auditors are amongst the upper tenth of the upper twentieth of intelligent human beings. Their will to do, their motives, their ability to grasp and to use are superior to that of any other profession. COB sends telexes to AOLA and Flag to cancel co-auditing by OTs. This is the first time since the release of the early OT Levels in the mid 1960s that OT IIIs who were also trained auditors could no longer exchange for auditing with auditing. "2. To help others go Clear and OT is why to train. 4. An advantage to training is that you can co-audit. 8. With training, you can outflow the technology to help others. 9. This will build respect, trust and integrity in YOU. 27. There's nothing like the feeling you've helped a person build his personal integrity and self-respect. As a trained auditor, you helped. As a result of this new prohibition, OT IIIs fully qualified to audit others on set-ups for higher OT Levels could no longer do so. Instead, they were transformed overnight into professional pcs, along with the untrained public. Thus, another motivation for training was obliterated — the desire to exchange for one's own auditing in the most ethical and economical way possible. COB announces the release of a new Professional TRs Course. Unlike all earlier versions of this course, COB's new Pro TRs Course is deemed a prerequisite for all Academy training. This is just the first in a growing list of prerequisites to auditor training. Others to follow include the new Upper Indocs Course (1991), the new Pro Metering Course (1996), and the Basics (2007). 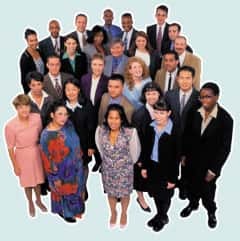 COB releases a new Upper Indocs Course. As with the release of the new Pro TRs Course a few months prior, the new Upper Indocs course is made a prerequisite to all Academy training. Also along with Pro TRs, the new Upper Indocs Course becomes a mandatory retrain for all veteran auditors, regardless of the nature of their earlier training, their track record as an auditor, or even their successful demonstration of the EP of this course in their auditing and life. This was not the first time others had attempted to recycle students through previously-done courses, either in an attempt to bolster sagging stats or for other reasons. “YOU CAN AUDIT ANY PROCESS FOR WHICH YOU HAVE BEEN CERTIFIED. Modification of the Primary Rundown. This makes the Key to Life Course and the Life Orientation Course — both lengthy and expensive courses — prerequisites to the Primary Rundown (PRD). "…THE PRIMARY RUNDOWN IS THE REQUIRED FIRST STEP TO ALL STUDY. …It is up to the Course Supervisor to hold this line in. His students will not prosper if their study is begun without a Primary Rundown. With the arbitrary addition of two lengthy prerequisites, this “vital step” for students disappeared from the training line-up once and for all. The PRD is currently unavailable at any org or mission on the planet. With the issuance of RTC ED #450, COB announces his revamping of every single auditor course checksheet. These include the Academy Levels, NED, Grad V, and the Briefing Course. He also heralds new checksheets for all Div. 6 (Introductory) courses, such as Life Improvement, Dianetic Seminar, Success Through Communication, and HQS. Finally, he announces the restructuring of all co-audit courses, such as TRs and Objectives, Scientology Drug Rundown, and Method 1. Each of these checksheets has since been compared to its earlier versions. In almost every case, they were found to be far, far longer — often two to three times or more. "Speedup of HDCs, Class IV, VI, VII, VIII and 'HGC Auditor' courses at all orgs, AOs (and SHs) would encourage more students. My time for it is 3 weeks. This was up to 5 and even 11 to 13 weeks at once by illegal checksheet increases. …Fast training gets students in. "Earlier this year I evaluated this auditor shortage scene. YOU HAVE HAD CHECKSHEETS WHICH WERE FAR TOO LONG." 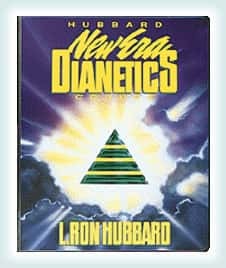 "Slow courses and fast auditing destroy the subjects of Dianetics and Scientology." At a Senior C/S Conference, COB unveils a new concept in F/Ns. Based on his personal understanding of the definition of the word “rhythm,” he accuses attendees of “falsifying F/Ns all over the place." The 3-swing F/N was born. "But how would one, who has not studied policy or is not very far advanced in his tech training know when he was being given an off-policy or out-tech order? 3. Read it for yourself and don't listen to any interpretation that seems far-fetched." "ANY PERSON FOUND TO BE USING VERBAL TECH SHALL BE SUBJECT TO A COURT OF ETHICS. THE CHARGES ARE GIVING OUT DATA WHICH IS CONTRARY TO HCO BULLETINS OR POLICY LETTERS, OR OBSTRUCTING THEIR USE OF APPLICATION, CORRUPTING THEIR INTENT, ALTERING THEIR CONTENT IN ANY WAY, INTERPRETING THEM VERBALLY OR OTHERWISE FOR ANOTHER, OR PRETENDING TO QUOTE THEM WITHOUT SHOWING THE ACTUAL ISSUE. ANY ONE OF THESE CATEGORIES CONSTITUTES VERBAL TECH AND IS ACTIONABLE PER THE ABOVE." In this case, the contrivance of COB's interpretation is borne out by the fact that, from the release of the bulletin What Is A Floating Needle in 1978 to the Senior C/S Conference in 1995, there isn't one known instance of a student or auditor, from Class XII on down, having come to COB's understanding of F/Ns on their own, despite thousands having word-cleared the definition. 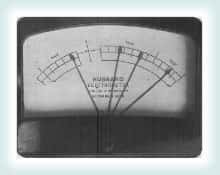 Since this redefinition of F/Ns was first incorporated into the Pro Metering and Solo courses, students have been referred to sources as far-fetched as the Art Series, the Marketing Series, a physics text, and The Encyclopedia of Music, in order to understand it. "A floating needle is a rhythmic sweep of the dial at a slow, even pace of the needle. That’s what an F/N is. No other definition is correct. "THE DEGREE OF COMPLEXITY IS PROPORTIONAL TO THE DEGREE OF NONCONFRONT. …THE BASIS OF ABERRATION IS A NONCONFRONT. …To the degree that a being cannot confront, he enters substitutes which, accumulating, bring about a complexity." "All complexity surrounding any subject or action is derived (comes from) a greater or lesser inability to confront." "…We find the flaw in all our actions to be the failure to separate out the truly basic important actions and instead engaging upon trivial complexities." "People who have Mis-Us in an area are inclined to develop vast complexities. They can generate confusions and complexities beyond belief." Following the introduction of COB's new F/Ns, many auditors and auditors-in-training began to experience losses due to their pcs overrunning in session. Some even quit auditing. "The first goof relating to Releases is the one done for fifteen years — running past a free, floating needle on any type of process. 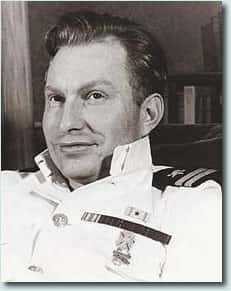 THIS is the goof that held back all Scientology. 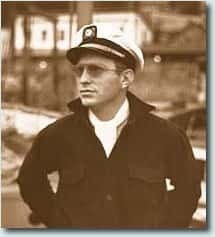 And if it continues to be done, known as well as it is now that you mustn't, one can only consider it suppressive — not just ignorant — as who now doesn't know you wreck a Release by running past the floating needle?" COB announces the release of a new Pro Metering Course. Like the new Pro TRs and Upper Indocs courses, Pro Metering is made into a prerequisite for all auditor training. Note: Academy students already have meter drills as part of their checksheets. This long and arduous course, requiring RTC video passes, has taken some students over a year to complete. It is also a mandatory retrain for all previously-trained auditors, regardless of their stats, products, or prior certification. COB announces the release of the Golden Age of Tech. 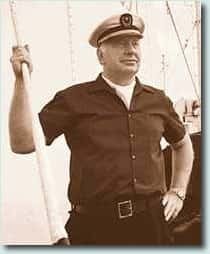 This consists primarily of hundreds of new drills written by Sea Org members by order of COB. This is not the first time others have invented drills for auditor training. Per LRH, it had been tried for years. Other practical drills are abolished. Reason: They consume time uselessly, suppress actual processes and mess up data and cases. I did not authorize these drills and have now seen that they teach alter-is of easy processes. They are not needed. They make poor auditors. I have just reviewed this matter thoroughly and have traced several training failures to these wildcat drills. Further, I traced several failed cases on course to them. If this is permitted to continue, we will no longer turn out good auditors. The standard drills as listed above have proven sufficient for years." In addition to all the scripted scenario drills for student auditors, there are dozens of memorization and paraphrase drills. "Giving a bulletin or tape check by seeing if it can be quoted or paraphrased proves exactly nothing. This will not guarantee that the student knows the data or can use or apply it nor even guarantees that the student is there. …So examining by seeing if somebody “knows” the text and can quote or paraphrase it is completely false and must not be done." The major philosophical underpinning of the Golden Age of Tech is the idea, championed by COB, that we should try to train Academy students to perfection, even prior to any Internship. 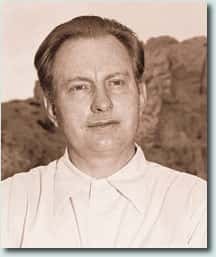 "When you try to standardize Class VIII style, the Dianetics course, or SHSBC, the Academy Courses, you slow people down to nowhere." 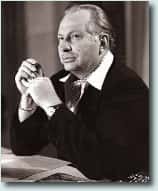 "Academies tend to slow or stop students with SHSBC checklists or unreal or altered training and so bar out Scientologists. We don't expect that much from Academy Grads." "The product of a course is a graduate who has learned his materials and successfully applies what he has learned. …The product of the Internship is a flubless professional. …When you confuse the two by failure to fully comprehend their actions and products you end up with overlong courses and overlong Internships." Immediately following the release of the Golden Age of Tech, Scientology course rooms took on a whole new look. Bookshelves were dominated by drill packs, tables covered with Simulators, and rows of students perched in front of walls, spouting entire bulletins verbatim. The items which do belong in a course room are covered in such references as HCO P/L “What Is a Course?” and HCOB “Courses, Their Ideal Scene". Drill packs, simulators, and room dividers doubling as walls for chanting students are not part of these or any other Source references. "The closer you adhere to the exact training pattern of an Academy as it has been worked out at Saint Hill, the better students will be…"
"I once had the idea that a group could evolve truth. A third of a century has thoroughly disabused me of that idea. On the other hand there have been thousands and thousands of suggestions and writings which, if accepted and acted upon, would have resulted in the complete destruction of all our work as well as the sanity of pcs. So I know what a group of people will do and how insane they will go in accepting unworkable “technology". By actual record the percentages are about twenty to 100,000 that a group of human beings will dream up bad technology to destroy good technology. As we could have gotten along without suggestions, then, we had better steel ourselves to continue to do so now that we have made it. …It remains that if in its formative stages it was not discovered by a group, then group efforts, one can safely assume, will not add to it or successfully alter it in the future." "Neither tech nor policy admit interpretation, alteration or “new ideas” generated by the bank. Bright, constructive application of exact principles, yes. Embellishment and know-best, never." "When all else fails, do what Ron said." The one remaining co-audit still allowed for OT IIIs — Class VIIIs co-auditing the OT Drug Rundown — is cancelled. According to RTC Rep FSO, this order originated “from way high up." This OT Drug Rundown co-audit had been specifically provided for by the Class VIII Course checksheet. 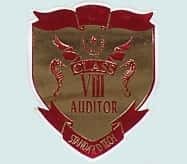 Along with the co-audit's cancellation, the modern Class VIII student is, for the first time since the release of the Class VIII Course in 1968, prohibited from auditing any OT procedures, despite the fact that these form a substantial part of his materials. "Class VIII Course teaches about exact handling of all cases to 100% result and specializes in OT processes and reviews. Processes taught are Class VIII procedures, all case set-up actions, OT processes and reviews." "A Class VIII auditor is an OT auditor trained in the special review technology used in all Quals for all levels and in particular the review technology of OT sections." This single most important aspect of Class VIII training has now been eliminated. In its place, the modern Class VIII student now audits the same procedures and rundowns he audited on his Briefing Course and on his Grad V Course before that — and no others. Thus, still another popular incentive to do the Class VIII Course has been lost — that of auditing others not just to Clear, but to OT. As of this writing (2009), there is one student on the Class VIII Course at AOLA, and none at Flag. An order from “uplines” institutes a mandatory HCO Sec Check before a student may start the Class VIII Course. This sec check is also made mandatory for those Class VIIIs who want to retread. 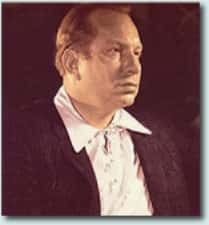 Never before in Scientology history has an upstat student been required to pay for and receive a sec check before he can continue his training. "The statement 'I am not auditing you' only occurs when a Confessional is done for justice reasons… (By 'justice reasons' is meant when a person is refusing to come clean on a Comm Ev, B of I, etc., or as part of a specific HCO investigation when the person is withholding data or evidence from such HCO personnel)." 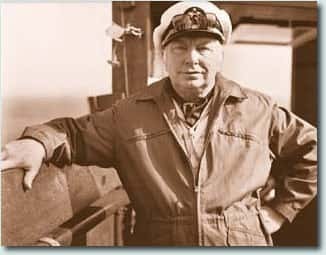 "The basic flaw in organization is INSPECTION BEFORE THE FACT. That means inspection before anything bad has happened. Violations are so harmful that they destroy every great civilization — the Roman, the British, the lot. For every flow is slowed or stopped. …Passports, customs, safety regulations, general government interference before anything bad has occurred, add up to a SUPPRESSIVE SOCIETY and therefore, soon enough, a dead one. Penalty after the fact has occurred disciplines the criminals and does not pull down the majority to criminal level." 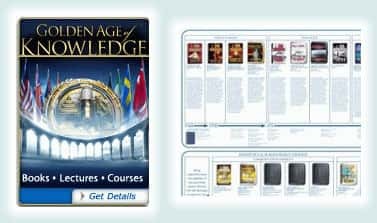 COB announces the release of the Golden Age of Knowledge. The first component of this program was the release of the Congresses and other LRH lectures, some never before released. "A chronological study of materials is necessary for the complete training of a truly top-grade expert in these lines. He can see how the subject progressed and so is able to see which are the highest levels of development. Not the least advantage in this is the defining of words and terms for each, when originally used, was defined, in most cases, with considerable exactitude, and one is not left with any misunderstoods." The Congresses, COB explained, provide that missing tool for chronological understanding. 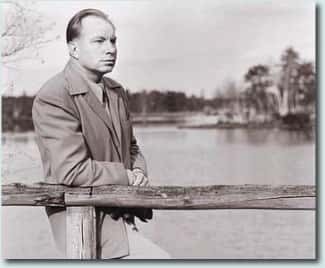 "It is for this reason that the Saint Hill Briefing Course checksheet should consist only of the chronological materials, studied in chronological order…"
Because of COB's switch in emphasis from the Briefing Course to tapes which one listens to in his home or car, this release did little to increase the making of auditors. 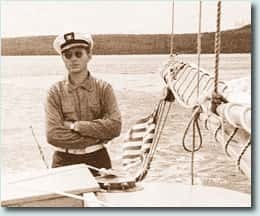 In fact, a number of Scientologists ended up routing off course to comply with orders to complete the Congresses by a certain date. The second component of the Golden Age of Knowledge was the Enlightenment Center, a huge device which can, at the push of a button, select and play any of numerous LRH tapes on 24 different subjects. Per COB, this was the tool which would flood the orgs with new public by enabling then to simply “Push button and cognite." While increased accessibility to LRH is always welcome by Scientologists, the Enlightenment Center proved to be a poorly surveyed product, as evidenced by the fact that it is rarely used. After its initial fanfare, the Enlightenment Center has been all but forgotten. Three years later, on the release of the Basics, he reiterated the same boast verbatim. "Students I was personally examining would begin to get a hunted look and carry dictionaries — BUT THEY WOULDN’T BEGIN TO NATTER OR GET SICK OR BLOW. AND THEY’D USE WHAT THEY LEARNED." "No Supervisor should try to define English words out of his own head when correcting a student, as it leads to too many arguments. On English words, open a dictionary." "To clear a word, one looks it up in a good dictionary." 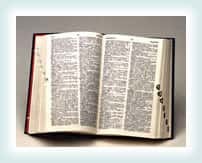 "Any word you come across which fits one or more of the above definitions of a misunderstood word or symbol must be cleared up, using a good-sized dictionary or more than one dictionary or textbook or encyclopedia." ...Supervisor: “Okay. Are there any words there that you have misunderstood?" …Student: “Ah well… ah… this one." Supervisor: “Good. Look that word up." …If a Supervisor does anything else, you’ve got a wrecked course. …If it is used, your courses start running fast, your students start learning quickly and all starts going well." Immediately following COB’s touting of his new glossaries, many Supervisors began to allow students to study in the Academy without dictionaries. Other Supervisors queried the point. Only a few held the line and did exactly what Ron says. 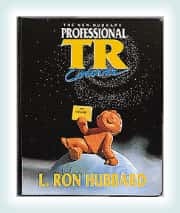 "A Supervisor who… lets students study without dictionaries and demo kits… and does not fully apply study tech and use Word Clearing is of course suppressive and should be declared, as he is actively blocking Scientologists from having and benefiting from Scientology." "…As study tech is our primary bridge to society and the basic prevention of out-tech and out-admin, if any offense as above found guilty in a Court of Ethics is REPEATED and person has had two such courts on this offense, the person may be summoned before a Committee of Evidence on a charge of COMMITTING AN ACT OR OMISSION UNDERTAKEN TO KNOWINGLY SUPPRESS, REDUCE OR IMPEDE SCIENTOLOGY OR SCIENTOLOGISTS, and if found guilty beyond reasonable doubt, may be declared a SUPPRESSIVE PERSON and expelled with full penalties." "What kind of a Super is it that doesn’t grab a meter and find the word? An SP? Or what?" COB announces the release of the Basics. 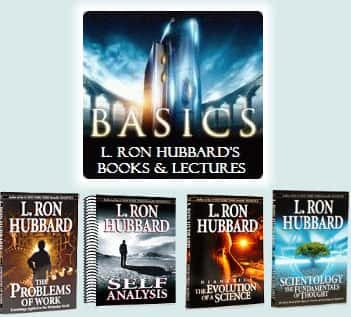 All Scientologists are ordered to do this course, which consists of 18 books and 280 lectures. Org course rooms designed by LRH for the training of auditors, such as the Academy and Briefing Course, are converted into course rooms for the Basics. Others, such as the Class VIII course room and Internships, are closed outright. Unlike standard Academy courses, the Basics — a course made up by COB — has no Practical Section, and teaches no auditing skills at all. LRH had witnessed experiments with pure theory courses before, including ones composed of all books. 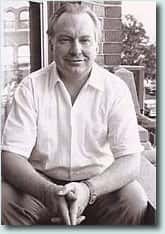 "Because we have all been trained in the educational system circa mid-twentieth century, we are liable to think that forming people up into classes and getting them to jump over books on schedule will educate them. Well it won't. We are here to train auditors, not to educate them. …You can dawdle around with theory outside an Academy, read books and so on. But in an Academy only can you LEARN certain things, and not all the books in the world will teach them." "Theories and processes can be picked up in books and from tapes as well as in classes. Technical skill cannot be picked up anywhere but in an Academy… a fact proven by years of observation." "…You can't teach in an Academy a small Saint Hill Course. Leave that to SH." COB again puts his attention on the field. 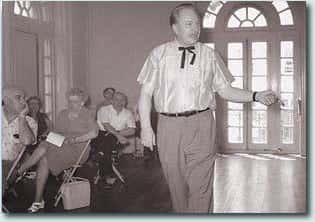 At an OT Summit in late 2006, COB lays out plans for “100% perfect auditing at all echelons of Scientology.” He tells the audience that new Golden Age Drills for field auditors who handle raw public are in the works. In an eerie replay of 1983, Qual terminals from Flag and ASHO enforce visits on the field auditors in the area, inspect their folders, take pictures of their homes and auditing rooms, and issue crams, retreads, and ethics conditions. Unlike 1983, however, a Qual Summons is sent out to every field auditor, threatening them with cancellation of their I HELP license if they don't obey. Additionally, a new post, “Bridge Tracking I/C", is established to monitor the field. Each field auditor is ordered to submit the names of every pc on his lines and to categorize them on a scale of 1 to 4 based on their current progress up the Bridge. Aside from the violation of HCOB Superior Service Image referenced earlier, many public who witness this scene privately comment that “it's too dangerous to be an auditor these days.” A number of field auditors concur, start looking for part-time work, or even quit auditing. Nearly two years after the release of the Basics (and many years after the two Golden Ages), training stats for new Class IVs, Grad Vs, Class VIs, Class VIIIs, and Internship completions are, each and every one, at an all-time low. 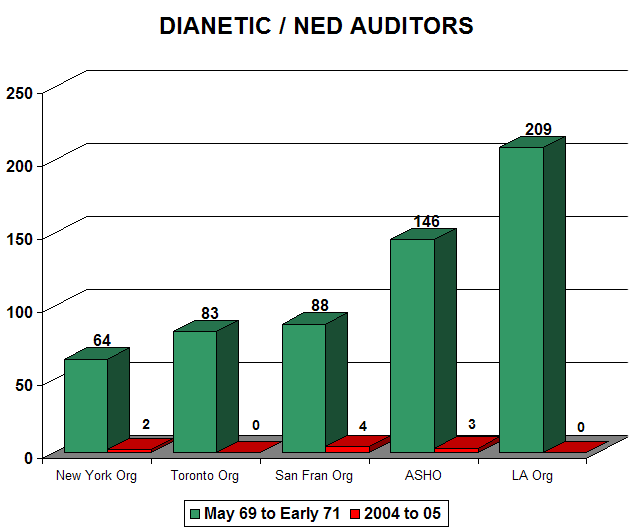 The fewest auditors made in Scientology history.